Seumas MacLetchie acquired a deep connection to the natural world from his father when he grew up on North Uist. Seumas makes the trip of a lifetime to meet Ingá-Máret, a Sami Yoik artist in Finnish Lapland, and learns about the persecution that the Sami people have endured. 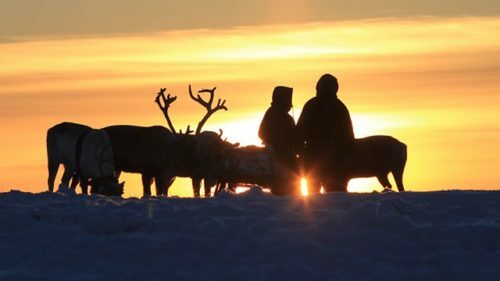 He discovers how Ingá-Máret’s ancestors used the power of yoik – their unique style of trance-like singing – to protect their reindeer herding way of life. A late Finnish President became an advocate for the Sami people and his love of skiing attracted many tourists to Lapland. Over time, tourism has developed and now attracts Norwegians who snowmobile for sport. The noise and speed panics the reindeer at calving time, causing them to stampede and abandon their calves. This along with changes in the climate which have brought starving winter conditions mean that the reindeer are struggling to survive. Ingá-Máret is determined to use her own power of yoik to protect the reindeer. Inspired by Ingá-Máret, Seumas reflects on what new Gaelic stories and songs might be created to protect his own culture?